Melbourne Heart defender Aziz Behich says Sunday' spirited comeback against Adelaide United demonstrated the player's support for Head Coach John Aloisi. Melbourne Heart defender Aziz Behich says Sunday's spirited comeback against Adelaide Uniteddemonstrated the Red and White's potential this season, and the player's support for Head Coach John Aloisi. Melbourne Heart nearly sealed an historic come-from-behind win after trailing Adelaide 2-0 at half-time in a memorable clash at AAMI Park, but settled for a 3-3 draw in a pulsating encounter. Behich helped inspire the second-half renaissance and contributed to the Heart's equaliser with a trademark run from the left wing, before cutting a precise ball for man-of-the-match Andrea Migliorini to rocket home his second of the match and level the scores at 2-2. 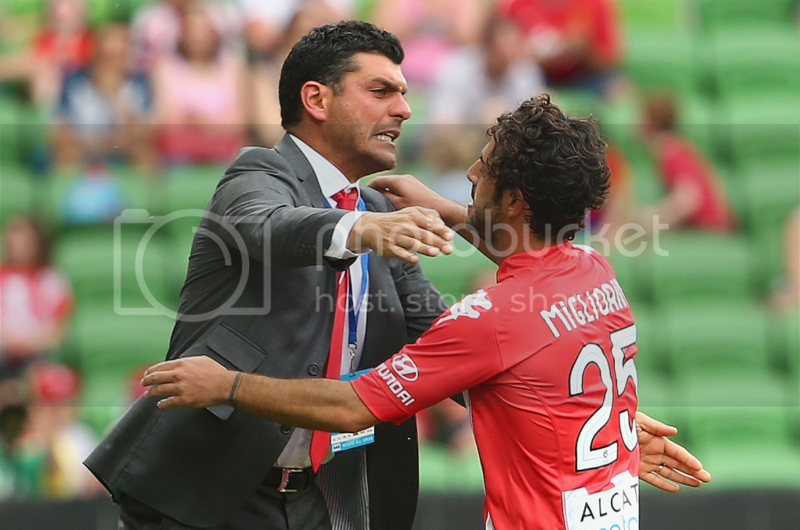 Both goals triggered passionate celebrations from Aloisi, and the celebrations following Migliorini's first goal, were telling of the player's support for their coach. Migiliorini, after scoring one of the goals of the Hyundai A-League season so far to make the score 2-1, went straight to Aloisi to embrace. Behich said the celebration was an example of the players' support for Aloisi. "Definitely, we back him 110 percent," Behich said. "We'll do that the rest of the season. We believe in what we're doing, we all back JA. "The coach is behind us as players and we'll back him the whole way through as well." To watch the full press conference, press play on the video below. Behich said he was happy with his form in Sunday's encounter, but said there was always room for improvement. "It was good to get an assist [and] get one on the board," Behich said. "But at the end of the day, it's all about the team. "Our second half was different class. "If we can take that from the get go, I think we'll cause a lot of problems."